I have never written a review of a book and thought I'd start with one that didn't have a review, but which highly deserved one. Therefore, much to my chagrin and frankly speaking, admitted relief, one has already been written which I echo and recommend in its conciseness. 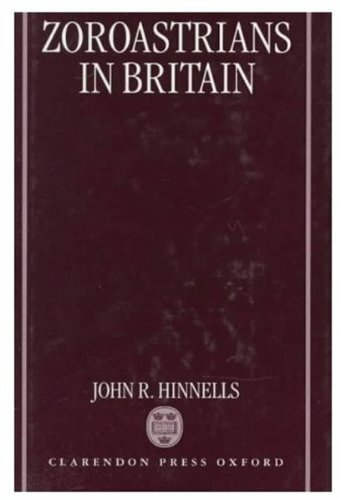 It must be said that I don't think Amazon recommends this book in connection to the few other sparse books on Zoroastrianism on this site (and for that matter, anywhere). Therefore, if you purposefully sought out this book as I did, I don't feel a need to flesh out Zaehner's credentials, nor do I feel the unique weight to flesh out the complications of Zurvanism elucidated within this magnum opus written at the height his Zoroastrian career. If Zoroastrianism is a niche subject attracting the adventurous few, than the Zurvanite heterodoxy (and its own sects!) in orthodox Sassanian times is doubly so. To be brief and hopefully not overly redundant: Zaehner ultimately proposes that Zurvanism, while being influenced by the neighboring cultures of the Chaldeans and Greeks, was itself a surviving remnant of an earlier native Iranian religion and that the priestly order of the magis originated in this system. Indeed, when comparing the latter Zoroastrian Church with its earlier Aryan form, there is lack of such institutions; but that syncretism was inevitable for cultural and political consolidation, as is per usual. The central problem to be reconciled then, of course, is Yasna 45:2 in the Ushtavaiti Gatha about the two Primal Spirits. (For more on what Zarathushtra may or may not have intended, I recommend Ashtiani Jalaleddin's simply titled 'Zarathushtra', though the English translation can be rough at times.) This is the problem which Zaehner wrestles with through philology, textual criticism, history and his own particular keen insight. At times I wanted to shoot myself. There, I said it. This is a book written for polyglots in ancient languages and such. However; I trudged through it all the same with a determination springing from my passion to learn ever more about the Mazdayasnian faith. However dry, and at times slightly dated, this is a seminal piece, original, and indispensable as was already said -- if for nothing else than the exhaustive passages and glosses of Pahlavi manuscripts, including Greek and Armenian sources and more as well (even Firdausi!). While SBE's and Mary Boyce's "Textual Sources for the Study of Zoroastrianism" are more comprehensive in the overall scope of Zoroastrianism, they don't include pages upon pages of Pahlavi transliteration! In conclusion, I add one huge caveat. 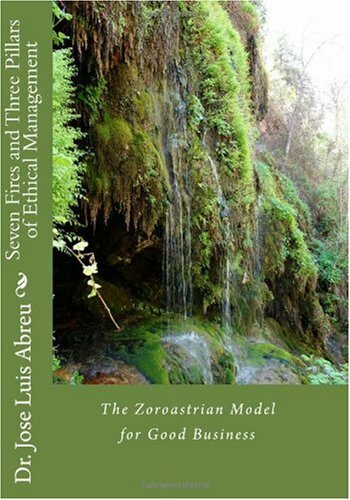 If you know nothing about Zoroastrianism: do not, under any circumstances, start here! R.C. Zaehner is much more accessible in "The Dawn and Twilight of Zoroastrianism", "The Teachings of the Magi", or even his entry on our pertinent topic in "Encyclopedia of the World's Religions" -- the latter if you just want a primer. If there is any author I could owe more to than Zaehner in opening up the world of Zoroastrianism, it is Mary Boyce. As opaque as this book could become, I'm not disappointed having read it. It was an investment as a future resource that I can now turn to whenever needed. Ushta te! 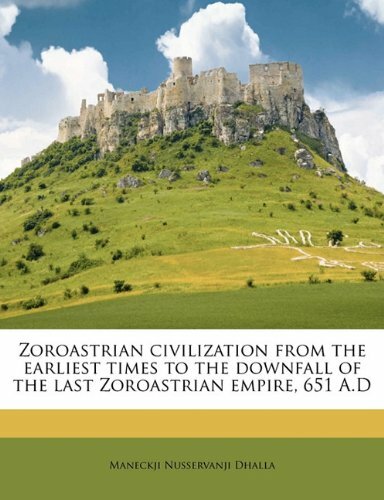 This is a reprint of an invaluable work on a well-known problem in history of zoroastrian studies (very importat also for the early christianism and Islam as a heresy), the zurvanism. Zurvanism is an attempt to acommodate the radical dualism of classical zoroastrianism (at least the religion reflected in Young Avesta and greek accounts) to a theological explanation of the existence of an Evil principle, for, if Ahura Mazda is all-good and all-wise, how can be limited by another god all-evil and all-stupid? The solution is a primigenie father of both (the twins Ohrmazd and Ahreman), the god Zurvan, Father Time who engenders such sons but does'nt interfere in the world. The book has two different parts: The firts, titled "The Argument" is an explanation of the zurvaist sect (or heresy), his opposition to "official" mazdeism in sassanian times, his cosmogony and mythology, etc; all according the pahlavi books such as Bundahishn. There are also references to the islamic-period epic poet Firdausi who, as it is well known, reflects very ancient legendary stuff. The second part, titled "Texts" is a monumental recopilation of original texts (a few avestic, a great corpus of pahlavi texts and also some new persian, arabic and greek texts) refering zurvanism. Avestic and pahlavi (transcripted) texts are all presented in original languages and translation; greek sources only in ancient greek. Other texts only in translation, some in german and french. It must be noted that due to the time of composition the avestan and pahlavi transcriptions are outdated in regard of the modern standards, but the work is usable. However, the inclusion of the transliterated pahlavi too is an important lack. This book answered to some question as followed: The Zoroastrian faith established on pinciple of worshping one God, duality of evil v.s good. The author of the book mentioned how today Zoroastrian people are living in Iran, India and broad. Still, they practice their faith. At the same time some ceremony; such as, death has and burial has changed theoughtout the time. It was sad that Alexandra the Great burn Perspolise library and this faith could not be fully investigated. Over all a fast easy read about the life & general teachings of Zarathushtra (Zoroaster) & his religion's influence on today's monotheistic faiths. 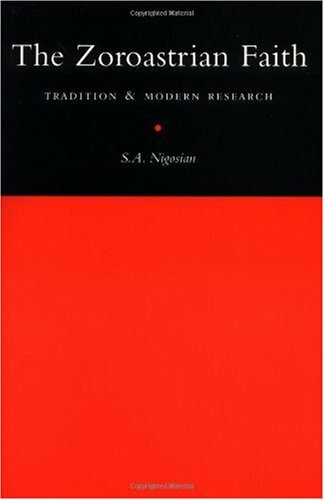 S.A. Nigosian goes to great length to get the exact information from many varied sources, which at times either reveals too much information in short paragraphs or causes certain vagueness. For example the dates of Zarathushtra (Zoroaster) are from 6000 BC from some Greek sources to appox. 650-600 BC. Other problem is that I never saw such a fast rendering of the history of ancient Iran in so few pages. At times a short paragraph per King or Kingdom. Maybe a chart or map would of help to clarify this information. In another area S.A. Nigosian uses the baptism rites of the Eastern Orthodox Christian Church as an example of the Zoroastrian rite without ever revealing the Zoroastrian rite itself. Could it be that most other religious history books cut too many corners & round off the information? Maybe to write the whole truth will always reveal the imperfections of history. Other than that the book was a pure delight going through the general practices, festivals, & calendar events of ancient & modern Zoroastrianism. 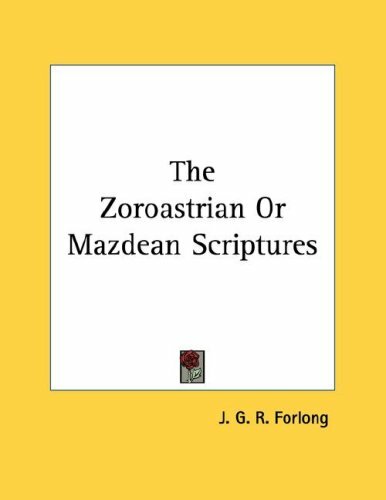 There are no photographs or visual information in this book that could help reveal certain clothing or life styles of the Zoroastrian faith. In fact I did meet a Parsi (a modern Zoroastrian from Bombay India) at a Jews for Jesus table at Cal State Fullerton California around the mid 1980's & saw his shirt that contain the chords to store his good & evil deeds, but I still would like to see a photograph of a fire temple & the rites performed. In other words I had a few problems with the style of the book, mostly due to lack of visual information, but its well worth the price if your looking for a grand overview of Zoroastrianism. This is an excellent description of the Zoroastrian faith.It begins with Zoroaster himself, dating his lifetime most probably and providing a compelling history of the man who ultimately had a tremendous influence on Western culture far greater than he could ever imagine.I believe it safe to say that he had more influence than Jesus himself, given the fact that the Zoroastrian world-view was subsequently adopted by a large contingent of ancient Jews, including Jesus, and ultimately spread around the world by Christianity and Islam. The history of the faith itself is then presented, along with key scriptures, teachings, and rituals.This book is excellent and truly fascinating reading.The Zoroastrian faith was far ahead of its time and represented an incredible philosophical advance in the ancient world that would have been completely foreign to most of the world's inhabitants but very familiar to you and I.The attractiveness of its beliefs could not be opposed even by the strictness of the Judaic world-view.In a remarkable way, Christianity and Islam represent the triumph of Zoroastrian ideas, and I found myself strangely saddened that this religion is near extinction.There is an inspiring grandeur to this faith as presented here. The book is well written, absolutely fascinating, balanced, and a quick read.I recommend it highly. This is a book about what is said to be the forefather of our great religions, founded by the prophet Zoroaster in very early civilized man.It would be commonly associated with fire worshipers as you would find sacred fires as places of worship.In simple form the fire was to the early man where you gathered for warmth, cooking and where humanity came together.While today the fire may be a symbol of the faith, in its beginning it was much more a practice to bring people together.Zoroaster believed there was a separation of good and evil at creation.How subsequent tenants of this concept transitioned from lessons around a fire to a doctrine still practiced 4000 years later begins with song.Have you ever had a song stuck in your head and you couldn't get it out?Well it was the Prophet Zoroaster who brought what is believed to be the world's first religion to humanity through song.In a land where writing had yet to be invented, Zoroaster would have his priests commit to memory the Gatha in song, later to be written down. This book is an academic account of the tenants of Zoroastrianism from is roots through all is evolutionary changes.With a sense of an archeological dig, the reader becomes aware of not only how the world affected Zoroastrianism but also how this ancient faith in turn influenced the Hindu, Buddhist, Jewish, Christian, and Muslim religions.This religion is still alive in corners of the world with strong holds in Tehran, Iran and Bombay,India.In a chronological format the author begins with an overview of the tenets of Zoroaster in the beginning and then pulls them through history capturingthe ebb and flow of humanity, giving the reader a sense of before,after and most important the present day pictures of life as a Zoroastrian.I found myself focused on the travesty brought on to this religion by Islam and therefore spend a bit of time dwelling on its relevant bearing on us today. *	Vendidad is a book read at night of the Avesta containing the code against demons. *	Dakhma - is the funeral practice of placing the dead body on a high platform for the vultures to eat the flesh.When there were only bones they would be collected and placed in an ossuary.This was out of respect for the earth as they believed the body would contaminate the pure earth. *	Spenta - is an adjective which characterizes the good creation, possessing power to aid. *	The Doctrine of Three Times - Creation, Mixture, Separation - makes history in a sense cyclical, with the world restored in the third time to the perfection it possessed in the first one. Meanwhile all the sorrows and strivings of the present time of Mixture as part of the battle against Angra Mainyu (evil).Thus Zoroaster not only saw a noble purpose for humanity, but also offered men a reasoned explanation for what they have to endure in this life. If one were to distill all the coda into a practical statement on the merits of Zoroastrianism you could say that Wisdom to see things as they actually are, where Justice is the result of making choices in alignment with reality, and Lying being the fraudulent representation of reality.However history and humanity collude to blur this message.The 21st Century view of Zoroaster's original tenant must be viewed through a kollidescope and thus provides reasons for debate.You could begin with the lack of the written word, using only the treasures of archeology as only clues to the testament of what was preached left in the symbols found in art.You must also contend with the evolving languages brought on by conquest, dominion and merging of one ruler over another. The effects are found in conquest and merging of cultures where a King could impose an interpretation of preceding doctrine thus imposing a schism in Zoroastrianism similar to what is found between Protestants, Catholics, and Lutherans in our western world. Since Zoroaster came before the split of the Indo-Iranian culture many of the tenants developed in the beginning had a significant influence over the beliefs, doctrine, and practices, of both the Hindu and the Buddhist people.Against the backdrop of geography and time, we all know that within one language the story takes on at least different colors and many times evokes completely new paths of thought.The next few paragraphs are dedicated to the train to modern day Zoroastrianism.Avestan was the language Zoroaster used in the beginning.This is found in his original Gathas as they were written down long after his death.Pahlavi was the language in the time of the Persian Kings.Sanskrit, albeit equally as old as or older than Pahlavi is the language of India, found it was in prominent doctrine through immigration.The Indo-Iranian split occurred well before Islam, however when Islam forced Zoroastrianism to take refuge tin Bombay, translation from both Avestan and Pahlavi to Sanskrit took on a prominent influence in how we see the Zoroastrian Doctrine today. With regard to critical deviations form its origins one could look at the Zurvanite split as the most prominent.This occurred under the Achaemenians times of Cyrus, Darius, and Xerxes.The Avestan word `zurvan' means `time' and in a few of the younger Avesta it was used as the name of a minor divinity, hypostatizing time.The usage appears to be a very limited concession to Zurvanites who had come to believe that Time, Zurvan, did not merely provide the framework for events but was actually in control of them, hence a sentient being.While this would be considered heresy to Zoroastrians it ended up under the rule of the King of kings as being a sect of Zoroastrianism.Simply stated by Zurvanite's through the authority of the King of kings, Ahura Mazda created both good and evil, which is contrary to Zoroaster who said he created all things good, and what wasn't created by Ahura Mazda was evil.One could easily draw the one -v- manyparallel story in the division of Eastern Orthodox and Western Christianity. The Manichaeism deviation took root under the Sasanian kings with the introduction of a man named Mani who was reared under the Semitic influence brought a pessimistic view on life. Since he gained favor of the King of kings he was given license to twist existing Zoroastrian text to give authority to his views.Again the original Zoroaster priest found heresy in his preaching. The Mazdakite deviation was brought on an ascetic pessimism where the Sasanian kings found common property to include the women of pheasants as slaves for the royalty.This fractured the families practicing the original tenets of Zoroaster as well strained the loyalty the people held towards their king and his religion.As timing would have it, it was against this back drop that Islam raged through Persia. In 636 (AD) the Muslim Arabs, driven by poverty and religious fervor, had begun to attack the rich lands bordering their deserts.They overran the Byzantine ....please do a keyword search on cigarroomofbooks.There you will find my concluding remarks and a relative bearing on today's world.Your comments are welcome there. 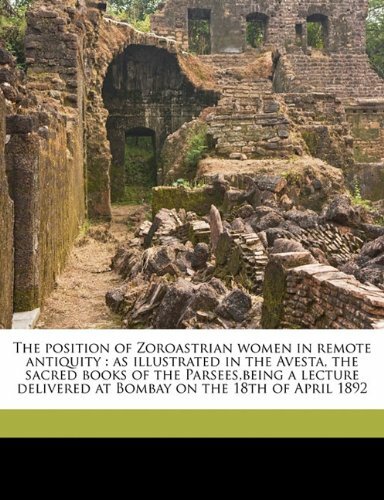 The books focuses a lot on the history of Zoroastrian beliefs and practices. It's not so much a thorough dissertation of Zoroaster's original teachings. This isn't a book if you're interested in something that focuses on the life and teachings of Zoroaster (a.k.a. Zarathustra), himself. Thank you to Mary Boyce ! The idea proposed by Mary Settegast is bold and exciting.It remain to be seen, if other scholars support her findings or not.The book itself was very well organized.She developed her idea in a very deliberate and methodical fashion.Her maps and illustrations are outstanding.Overall, I recommend this book to all who are interested in mid-east ancient history. The subject of Zoroastrianism tends to lead even reputable scholars to flights of fancy in order to fill in the blanks, of which there are many.Such speculation is perhaps permissable when one has a command of the languages, disciplines, original sources and critical materials.The author is clearly lacking in these prerequisites and has produced a work of fiction masquerading as scholarship.Are we truly to believe that Zarathushtra was an agricultural activist/potter/alchemist who transmitted his teachings by means of arcane designs on well-made ceramics in the second half of the seventh millennium B.C. ?Some ceramic designs indicate lack of motion and therefore teach Zarathushtra's doctrine of the stasis of perfection.Other ceramic designs indicate motion and therefore teach his doctrine of progress toward perfection through the struggles in the time of themixture of good and evil.I am sure that the author could also find Zarathushtra's teachings in a ceramic bowl with no design at all.Faced with the author's assertion that one man could cause the spread of agriculture throughout the Near East, Southwest Asia, and Europe by making it a major feature of a religious revolution, which then failed, leaving only the tradition of settled farming communities as its legacy, one can only admire the scope of her imagination.For a more grounded view of Zarathushtra, read anything by Mary Boyce. Clean, clear, and scrupulously documented, When Zarathustra Spoke is a must-read for anyone interested in the origins of civilization. Mary Settegast has found good and sufficient reason in the archaeology of the Neolithic Middle East for taking seriously the passages in ancient literature that place Zarathustra in the late-seventh millennium BC. I found her argument to be both intelligent and persuasive, offering a fresh approach to the question of why the agricultural way of life spread so quickly after 6500 BC. As a concerned environmentalist, I was particularly struck by the depiction of Zarathustra as not only the moving force behind this rapid diffusion of farming but also the first to designate man as steward of the earth.Fascinating. New insights on the "Neolithic Revolution"
I loved it! What a treat to find a truly original - and radically controversial - idea backed up by solid scholarship. This elegantly written book owes its existence to the fact that the author refused to dismiss the accounts of ancient Greek and Roman historians (Pliny, Eudoxus, Xanthus, Plutarch) that mention Zarathustra and place his life thousands of years before conventional estimates. 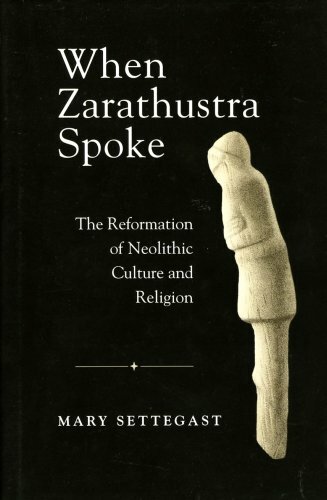 Armed with new information made possible by advanced archaeological techniques, Settegast makes a compelling case for linking one of the great puzzles of Neolithic archaeology - the "sudden and irrevocable diffusion of the agricultural way of life" - with the simultaneous spread of Zarathustra's religious imperative emphasizing the role of farming in the religious life. A fascinating read. Is it possible that Zarathustra, the famous founder of the Persian religion which bears his name, could have lived during the seventh millenium? The great German mystic Rudolf Steiner, for one, thought so. And so did the Greeks, for some of them regarded him as living at about 6500 b.c. Most modern scholars of the subject vacillate between the two dates of 500 b.c. and about 1500 b.c., and since the language of the Gathas bears many similarities with that of the Sanskrit Rig Veda, many favor this latter date. But Mary Settegast has revived the tradition of dating him in the seventh millenium, for she believes that the archaeological evidence from this period most closely fits with the narrative schemas of Zoroastrianism. The middle of the seventh millenium was a time of great change in which the preceding period, known as the Pre-Pottery Neolithic B, with its skull cults and worship of male virility in the form of statues and bull's heads, was begining to fade away. The making of weapons, furthermore, in the form of arrowheads and speartips, simply vanishes during the new period, that known as the Pottery Neolithic, as farming communities in both Greece and Iran began to take up the practice of agriculture in earnest. This phenomenon is interesting, according to Settegast, in light of the fact that Zarathustra privileged the farmer over the warrior class. The newly dawning Pottery Neolithic also brought with it new culture forms, such as the making of the world's finest painted pottery on vessels which apparently had no practical use, copper and lead metallurgy, irrigation and generally smaller settlements. The iconography of the pottery from this period is elaborate and amazing. Far from being--as some scholars think--mere decoration, the motifs articulated on these vessels have a definite cosmological and mythological significance. Whatever such significance was, it is now lost to us since no writings--or even oral traditions--have survived from this period, but Ms. Settegast believes that its iconography becomes intelligible in the light of Zoroastrian mythology. The emphasis on dark and light contrasts, checkerboard patterns, double axes, all are motifs based on the principle of cosmic polarity, which is, of course, the whole basis of Zoroastrian cosmic dualism. Other phenomena from this period may also fit well with the Zoroastrian ethos. Irrigation, for example, which appears during this phase for the first time, was known in later Zoroastrian texts such as the Vendidad as a sacred duty. We also find miniature mortars and pestles from this period, which is interesting in light of the later Zoroastrian ritual of the yasna ceremony, in which the cosmic mortar and pestle were used to grind the sacred haoma plant. This book offers a new approach to the vexing question of how to write the early history of Islam. The first part discusses the nature of the Muslim and non-Muslim source material for the seventh- and eighth-century Middle East and argues that by lessening the divide between these two traditions, which has largely been erected by modern scholarship, we can come to a better appreciation of this crucial period. The second part gives a detailed survey of sources and an analysis of some 120 non-Muslim texts, all of which provide information about the first century and a half of Islam (roughly A.D. 620-780). The third part furnishes examples, according to the approach suggested in the first part and with the material presented in the second part, how one might write the history of this time. The fourth part takes the form of excurses on various topics, such as the process of Islamization, the phenomenon of conversion to Islam, the development of techniques for determining the direction of prayer, and the conquest of Egypt. Can somebody please tell me where I can get Suliman Bashear's book "Introduction to the other history" ? I started reading this book in hopes I can get better understanding of 7th-8th century AD from sources other than Muslim sources. Prof. Hoyland did not disappoint with this treasure book. His unbiased analytics of the scriptures, cross referencing every material with numerous other sources as to establish the validity of the source is a great task that he had undertaken eagerly. I can't imagine the amount of research that went into this book, quite astonushing. The book is close to 800 pages, but only 600 pages deal discuss the work and 200 pages of references. It is clear the author took keen care of examining all materials available including architectural designs relating to that period. The book in my opinion explains why you simply shouldn't take scriptures of Muslim/non-Muslim sources alike for being true. Many of the old scriptures include apologetic works, polemical stories and sometimes right out exaggerations. This book serves to correct what Crone and others assumed by taking scriptures of non-Muslim and claiming it to be the only explanation for how was Islam in 7th century. The book is packed with scripture quotations from the Greeks to the Chinese on issues related to the rise of Islam. The book showed that Muslim sources of 9th/10th AD describe closely in the same way the events that non-Muslims had written in 7th/8th AD. I'll be keeping this book in my library and pass it on to my children. It is a treasure of historical magnificance. The sad part though, the same issues arose during that period between Christians, Jews and Muslims still exist until today. It is clear no siding is winning, and no Messaiah is coming. Kudos to the author, he and all those took part in producing this work deserve our gratitute. While there might be a little analysis, the most valuable task the author has engaged in is collecting a number of non-Arab and non-Muslim sources regarding Islam. This is one of very few books that endeavors to do so and is a massive tool for any scholar seeking to explore Islam via non-Islamic sources. The sources range from a plethora of Greek sources to a few from the Syriac and even a few Persian ones. This is clearly no easy task and the reader profusely thanks the author for his dedication to the subject. This analysis is easily skipped over in the rush to get to the actual sources. As one such person, the commentary and analysis is not a subject I can comment on but the sources themselves are a pleasure to have. Reading those sources (the footnotes can also be very revealing) whets the appetite for more and there are certainly more documents out there (many a Syriac Christian library still exists in Turkey and Syria) to be translated and put to use by scholars. Two of the reviews posted here suggest that the we might title them "Seeing 'Seeing Islam. . .' as Others Saw it." The New York reader's propoganda for Hagarism and other far-fetched perspectives is explicitly taken on and refuted in Hoyland's Chapter 13.Chapter 14 begins, saying "... it is a strong argument in favor of [Muslim witnesses] that they do frequently coincide with what is said by [non-Muslim witnesses]." This book is mostly a sober, almost 19th-century style translated collection of all the sources refering to Muslims and Islam in the first (roughly) two centuries of Islam. These sources are organized (a bit frustratingly for this reader) by the language of their origin (rather than chronologically). Execurses collect early Muslim sources, and various chapters meticulously discuss the sources, how they can be used, and other methodological issues. The author then carefully, soberly, and very persuasively draws conclusions about the original Muslim self-identity, the cultus, the nature of the early community's religiosity (or religiosities) etc. It is a tour de force work, invaluable for those interested in Early Islam and it puts paid to speculative, thinly evidenced, and frankly hostile works like that of Nevo and Koren. It's a pity that it is so difficultto find, however. The book is quick on conclusions. It avoids any analysis of archeological finds that do not accord with such conclusions. The fact of the matter is that much evidence support the 'traditional' story of Islam, in particular in the Fertile Crescent where archeological finds have not contradicted the 'traditional' story. The fact that no such digs where ever conducted in the birthplace of the entire movement is regrettable. Incidently, Mecca should prove a veritabley exciting site, given the fact that it had been on a trade route for probably hundred of years before Mohammed's time. An only child is burdened with an unfair amount of attention and expectation, and so it is with Farhang Mehr's ZOROASTRIAN TRADITION which is the only introduction in print, in English, by a native Zoroastrian, to contemporary Zoroastrian belief.Even without alternative perspectives Prof. Mehr's book is outstanding.It takes a moderate positionbetween reactionary and revolutionary interpretations of Zoroastrianism at the same time as it presents its own vision of an ethical and mystical religion which is not only alive and well but growing in numbers and influence. Dr. Ichaporia found Professor Mehr's English to be poor.I've read the book cover to cover three times and I found Mehr's command of English to be perfectly fine.Dr. Ichaporia also implies that Professor Mehr should stick to politics and leave religion to the scholars.All well and good except to date no scholar, Ichaporia included, has attempted a book of this scope, for the most part preferring to pick at each other's translations of Zarathustra's sacred songs (the Gathas) instead of sharing them with a general readership. Prof. Mehr's life and career have been well-documented in TRIUMPH OVER DISCRIMINATION.His religion is hard-earned in the front lines and trenches of policy and diplomacy.I trust Mehr to know whence he speaks and I heartily recommend this book to those who wish to know what Zarathustra's vision looks like in real life rather than in academic monographs. After becoming suddenly quite interested in Zoroastrianism after a class on Asian religion one day, and failing to find reliable sources on the internet, I checked out this book in order to begin a study into Zoroastrianism.I have to say that it was such a good read I finished it all in two nights.Mehr's presentation of Zoroastrianism I find highly compelling and very good and well-rounded for an introduction to the religion.From this point I plan on doing much more in-depth study of Zoroastrianism, but I am very thankful to have chosen this book as a beginning point for a proper setup in understanding the wider scope of Zoroastrianism.I also like the fact that Mehr is Zoroastrian himself, as I would prefer to learn about a religion from one of its adherents rather than an outsider (though both are beneficial), at least to build a proper foundation; so that certainly makes it a good beginning point upon which I will pursue a much more exhaustive study. The only complaint I have about this book is that there are typos everywhere.There are two on the back cover alone, and within the text there are errors in a way that if the author or any editor read the book they would be impossible to miss; so I really do not understand what happened there.Other than that oddity this is a great read that I would recommend to anyone interested in religious studies and spirituality. 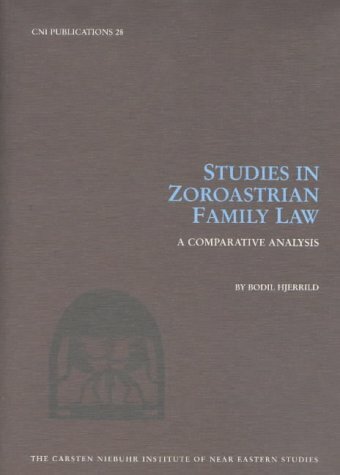 An only child is burdened with an unfair amount of attention and expectation, and so it is with Farhang Mehr's ZOROASTRIAN TRADITION which is the only introduction in print, in English, by a native Zoroastrian, to contemporary Zoroastrian belief. Even without alternative perspectives Prof. Mehr's book is outstanding. It takes a moderate position between reactionary and revolutionary interpretations of Zoroastrianism at the same time as it presents its own vision of an ethical and mystical religion which is not only alive and well but growing in numbers and influence. In a review of a previous edition of this book Zoroastrian scholar Pallan Ichaporia found Professor Mehr's English to be poor. I've read the book cover to cover three times and I found Mehr's command of English to be perfectly fine. Dr. Ichaporia also implies that Professor Mehr should stick to politics and leave religion to the scholars. All well and good except to date no scholar, Ichaporia included, has attempted a book of this scope, for the most part preferring to pick at each other's translations of Zarathustra's sacred songs (the Gathas) instead of sharing them with a general readership. Prof. Mehr's life and career have been well-documented in TRIUMPH OVER DISCRIMINATION. His religion is hard-earned in the front lines and trenches of policy and diplomacy. I trust Mehr to know whence he speaks and I heartily recommend this book to those who wish to know what Zarathustra's vision looks like in real life rather than in academic monographs. This is a great book for someone researching the Zoroastrian faith and religion. It is not the most up to date work, but it contains far more in depth information than more modern works which have skipped some of the finer details. I wouldn't recommend this for the beginner - they would be better served by such works as "Persian myths" by Curtis, "Persian Mythology" by Hinnells, or "Wise Lord of the sky" by Allan. But for someone wishing to research the religion, this and R.C. Zaehner's books are truly excellent. The First Monotheistic Religion Explored in Depth! wonderful book. very pictorial. brings a lot of nostalgia to every zarthusti. loved the book. loved everything about the culture. would love to see a bit more about ancient persia and a more wider view of our ancestors. there are several beliefs and the reader should have the option of knowing all the historical theories of ancient persia. nevertheless this is a must for every parsi family. even though it is a bit expensive there is a lot of hard work , research and love in this book.well worth the price . thank you for enlightning us. would love to see what are the true ideas behind the zorasatrian philosophy that conversion is a sin. i mean real evidence. not some interpretation ofso called vada dastoor's who bend religion to the extreme that it makes you wonder if we really are the great zorastrian religion we proudly proclaim our self of being. This is a must have book for those who admire Zarthushties--as we say it in Iranian/Persian. It is also a tough act to follow for the future writers. I was fortunate to attend the Firooz Bahram high school, a Zarthushti school in Tehran and learn how wonderful my Zarthushti friends are. I have since read a lot on their religion, history, culture and social habits and I must say this book is very faithful to the character of Zarthushties. I review only the works that are of highest quality and try not to say anything about a work if I can not say the nicest things about it. In that spirit, I give this book a 5 star.The book is a keeper in any good library and more addictive than food if left on a coffee table. A Zarathushtrian Labour of Love and Sacrifice. The Editors of this magnificent and massive volume (762 folio pages) deserves the deepest thanks of the Parsee community of Bombay in particular, and Zarathushtrians in general on a global basis, for compiling for us, what is truly a "labour of love and stupendous sacrifice".The high quality of paper, printing, the selection of the articles, the magnificent coloured illustrations, the comprehensive glossary and chronological tables, truly makes this volume as one of a kind, that every Parsee household would do well to have on their prized book-shelf.The list of article contributors to this volume almost constitute a who's-who in the field of Iranian studies.Many of the reproduced photographs and illustrations are made available to the public for the first time.Every page delights a reader with uncanny information or stunning pictures or a fact of odd rarity.However the list of "Select Bibliography" at the end could undergo a substantial upgrading. steeped in ignorance and arrogance. The book is beautifully done, but to use it as a coffee table book I cannot display with broken corner.Advised them second time, but no reply.As I live in Mexico it is difficult getting mail in and out and also expensive.Very disappointed. The Meaning Of The Term "PARSI"
I have not read the book, but I'm willing to give it the benefit of doubt and give it a rating of "5". The purpose of my "review" is to put the term "Parsi" in its proper perspective. "Parsi" literally means "Persian", since "Pars" is the true name for Persia. If we are to follow this logic, then to all intents and purposes the Zoroastrians in Iran today are the true "Parsis". 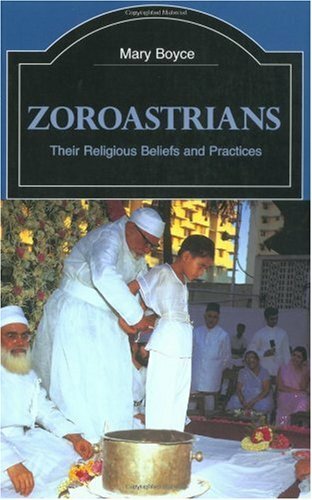 Therefore, only the second part of the title of this book "The Zoroastrians of India" is correct. The dichotomy can therefore be explained very simply - If you are Indian then you are not "Parsi" and vice versa. One cannot be Persian and Indian at the same time. The Zoroastrians of India have adopted Indian customs and ceremonies, do not speak a word of Persian and therefore do not understand the content of one-third of the Avesta, which is written in Persian. This is tantamount to completely losing their original identity as a people. Blending in with the country of adoption to the point of adopting the language and customs of that country and willingly losing all trace of their origins, and practicing a brand new identity is fine, if they would prefer to do that. However, by labeling themselves as Parsis, they are committing a travesty of justice to the true Parsis in Iran who have practiced the faith against insurmountable odds. And if the Zoroastrians of India are bent upon propagating and promoting their new identity, then they should not create their own sectarian institutions in India but should be willing to blend in with the rest of the Indian community. They cannot have it both ways. And as for not allowing intermarriages or conversions, well, study the Kalme-e-Din in the Avesta. It tells you that the Zoroastrian faith was "sent for the people" (baraye khalk ferestade). That perhaps is the single-most damning evidence against the proponents of non-conversion. But one needs to know the Persian language to understand that. And one last word on this: The Kisse-E-Sanjaan never happened. There is no documented evidence of such an event in the annals of "Parsi" history. And even if it did occur, then it's an affront to scribe a monument in its memory, in Gujerati. That's how far the "Parsis" of India have strayed from their true beginnings. Naming their children with meaningless Persian-"sounding" names will not make them Persians or should I say "Parsis". And as for preventing intermarriages to save the purity of "race", they should take a look in their mirrors and be honest with themselves. The story of the author's family, temple, and home life is interesting enough, but the book is rewarding on sheerly photographic merits alone.The familiar urban India of crumbling concrete, colorful shutters, thronging streets, and hole in the wall shops is vividly reproduced here.It is oddly refreshing to not have India's poverty on display--we know it exists, but that's not the point of this book.The people herein range from the wealthy to the shopkeeper class.It is not, as similar books by non-Indians are prone to be, a cavalcade of exotica. A deaf, wizened grandfather shouting at a fountain pen repairman. An abandoned, one-room temple, still with its devotional portraits and wall clock, inhabited only by a crow on the ceiling fan. Young priests performing a rite over a ceremonial feast, on the floor in a daylight interior space. A wealthy art patron and wife, in their sumptuous living room. Several river scenes, with devotional activity such as reciting verses or praying in the water. A Parsi and a Nepalese seated together on the train--a contrast of ethnic types. A man with a distinctive face, such as Leonardo da Vinci collected in his sketchbooks, snapped with the telephoto lens while waiting for the bus. And plenty of home scenes, like one of mother, friend, and tots, enjoying a play date on the English-looking lawn.Except that it isn't grass, but some other wide-bladed carpet plant, instead. These scenes are all expertly and affectionately photographed, and presented with genuine warmth. I bought this book on a whim for a friend and it was one of the best decisions. Sooni's photos really capture a culture and moments in time and help narrate a wonderful experience of sorts. 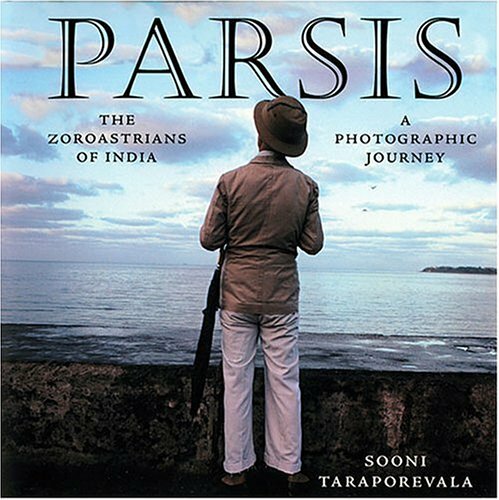 Having visited Bombay several times, I was very impressed by the manner in which she shows the Parsi culture through her simple yet poignant photos. I recommend this book highly! The "Qesse-ye Sanjan" Newly Analysed. 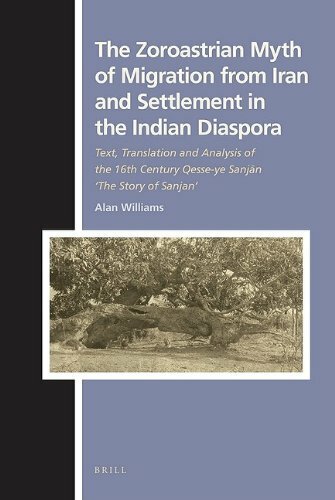 The publishing house of Brill has once again done a yeoman service to the Zarathushtrain community, in publishing a recent work of Dr. Alan V. Williams titled : "The Zoroastrian Myth of Migration from Iran and Settlement in the Indian Diaspora".It is of course the text, translation and analysis of a sixteenth century Persian manuscript titled Qesse-ye Sanjan (The Story of Sanjan) authored by one Bahman Kay Qobad Sanjana.As the "Introduction" on page 1 states, the purpose of this book is five-fold. to produce a new edition of the Persian text of the Qesse-ye Sanjan, from the best and oldest manuscripts,  to transcribe a romanised Persian text and offer a new literal translation, parallel to the transcribed text,  to provide a detail commentary on the text,  to discuss the narrative structure of the text, and  to discuss the mythological and religious dimensions of what is a foundational document of the Parsi Zarathushtrian culture.Perhaps for the first time in an easily accessible format, Zarathushtrians can see the facsimiles of the eleven folios of the SH manuscript of Darab Hormazdyar's Revayet ((1680), containing the Qesse-ye Sanjan, currently housed in the Library of the K. R. Cama Oriental Institute in Mumbai (Bombay), India.But what is this manuscript and it's message? It is a Persian verse composition of a story of defeat and victory, leaving and arriving, revenge and recconciliation.In the broad sense of an idealized story, the "Qesse-ye Sanjan" tells an account of the whole civilization of Iran, smashed, and how the Zarathushtrians who were inspired and guided by their religion, sought to make a new home in a new land (India).In response to this loss and displacement, it also tells of how the Zarathushtrians of Iran, became the Parsis of India. The significance of the text touches the Parsis very profoundly, as they have no other account of their origins as a community that once emigrated from Iran.